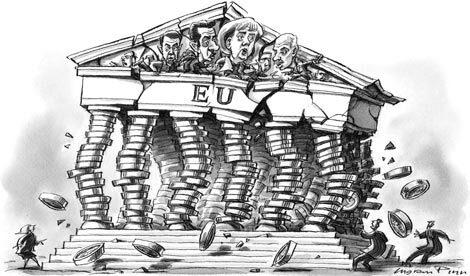 These are troublesome times, even for Greece, a country that has seen many a troubled day since the start of the European debt crisis. The Syriza government announced a referendum on short notice and based on an incomplete EU proposal. The harsh reactions of EU-representatives, particularly those of the Eurozone’s Council of Finance Ministers, as well as public debates on the media: all have been characterized by a sense of emergency, astonishment, irritation and anger. This emotional treatment of what have been hailed to be technical matters, such as sovereign debt, are clear signs that the fate of not only Greece and not only of the Eurozone, but of some very fundamental principles of the European Union, are at stake. The future of the European Union as a whole is being boiled down to a ‘yes’ or a ‘no’. Will the EU, again, reflect the values of the Maastricht treaty of an ever closer political union, perhaps incorporating elements of fiscal equalization? Or will these principles be diluted to a mere coalition of economically willing and able countries, fulfilling strict austerity the requirements? That is to say: will a united Europe follow a political ideal or mere economic necessity? Oddly enough, it was the referendum, the ultimate symbol of democratic expression, which fueled Eurozone leaders’ dissatisfaction towards Tsipras’ government. Referenda can boast political decisions with amounts of legitimacy hardly comparable to any other political process. Yet, the Greek referendum is by no means a role model for the correct use of such a potent tool – too short a notice, too unclear in content, too biased for/against the standing government. The result was the perception throughout Europe of the referendum as a tool not at the service of democracy but as a tool for blackmail. Interestingly, within days, the EU shifted from a total refusal to tacit acceptance and outright political campaigning in favour of a YES. Did the referendum gain legitimacy over night? Yes and no. On the one hand, the preconditions for the referendum remain disastrous. On the other, Europe seems to have realized that this vote is about more than a bailout – it’s about political vision. Perhaps, recalling 2011, when the then Greek Prime Minister Papandreu was forced to backtrack on a public vote for or against European Emergency measures, EU leaders may have come to realize that the problem of legitimacy surrounding austerity policies could not be, once again, swept under the rug. This realization may have informed the decision to embrace a new strategy: to strive for the democratic legitimization of austerity policies by persuading the Greeks to vote for a yes. However tempting the concept of a referendum is, a look at outcome scenarios shows that a Greek vote on the issue is too little and too late to fend off the disastrous consequences of past years’ policies in Greece and the Eurozone as a whole. The Greeks turning down the referendum would mean that EU and ECB support would end without further delay. IMF financial assistance has already come to an end with the partial default on June 30th. Greece would be forced to either pull out of the common currency immediately or to introduce a parallel currency and phase out of the Euro within months. Factoring in the legal constraints inbuilt in the treaties, which do not foresee Member States’ exit from the Euro, Greece may be forced to leave the EU altogether and later re-join the Union, yet not the Eurozone. In this scenario, the Greek economy would be radically restructured by the Syriza Government, which could use monetary policy to stimulate growth. Yet, what is certain is that Greek living standards will suffer significant deterioration, assuredly so at least in the short run. On the contrary, the eurozone could possibly come out of a Greek exit strengthened and more solid, as far as confidence in the other “peripheral” members remains. Yet, a “Grexit” would create a dangerous precedent, which could be used by other Eurozone countries to abandon the common currency, default on accumulated debt, and regain the national economic sovereignty needed to implement more welfare oriented economic policies. Talking geopolitics, Europe and the US will find it harder to keep Greece on board NATO as a strategic partner in the eastern Mediterranean. Financial support and partnerships with Russia and China become increasingly credible with Greece out of the Eurozone, an ongoing Syriza Government, low economic performance and fewer incentives to cling onto Europe. With conflicts in the Middle East on the rise, the influx of refugees, emerging energy questions and an unpredictable Turkish foreign policy, Greece could become a major security issue to the alliance. According to the polls, a Greek YES is becoming more and more realistic, and it would most probably imply further negotiations. The Syriza Government would have to step down and call for elections within months. The question would be: who leads the negotiations with the EU? It could hardly be a failed Syriza party member – but perhaps some kind of caretaker government of national unity (if Greece manages to swiftly re-organize, which is far from obvious). Yet, no matter who will be in charge on the Greek side, the EU will have gained negotiating power and – finding itself in a far stronger position – it will be able to impose its (stricter still?) austerity policy. Much will depend on the perception by European leaders of the Greek situation – have Greek citizens hit the bottom or will they suffer a further reduction in disposable income? And, perhaps even more important (and hardly contingent on Greece): What will the EU’s economic outlook in the coming years look like? A stronger German economy, a recovery of France and the evolution of the UK’s membership may well play a crucial factor in the depth and duration of Greek austerity measures. What is still unclear is the how the EU – not only the Eurozone – will choose to politically address the Greek case. Will it be able to design a strategy for the coming ten years that reflects the economic as well as the political challenges of the Union in a way that responds to current critiques and skepticism towards the idea of Europe which have emerged as a reaction to sustained discrepancies between member states? In the end, could we end up with no referendum? It’s a very unlikely option. Yet, a new offer by the EU with “softened” austerity measured might just do the trick. Indeed, both sides are still upholding that they have not abandoned the negotiating table and there were even some statements made by Greek officials about the possibility of cancelling the referendum – shortly dismissed by other officials. Formally, the cancellation of the referendum would represent a serious aggression on democratic participation at the EU level. It would mark a clear supremacy of the economic versus the political. And it would also mean less trust in European institutions and their representatives – a development that would give further support to anti-European movements across the continent. On the other hand, in the case of this referendum: lacking clarity, the necessary diffusion of information and subject to such stringent timing, it would probably still be the best solution for the future of Greece and the EU. European leaders finding a negotiated solution could show that the EU institutions are still capable of applying the binding founding principle of bounded solidarity and demonstrate it possess the necessary adaptability for ad-hoc problem solving, and that it is able to do so without forcing an elected government out of office. Yet, a word of warning as to patch-up solutions, which may be convenient for the Eurozone at this moment in but may be risky in the long run – mechanisms that only work on the brink of collapse can hardly become everyday working arrangements. In the end, with two scenarios out of three foreseeing catastrophic economic consequences for Greece, what does this referendum realistically mean? Could it lead to a more democratic and political Union? Or will it represent its demise? Letting the Greeks vote is putting the cart in front of the horse. A crisis and an abrupt abandonment of negotiations are no healthy grounds upon which to call for a referendum. However, perhaps this is how the EU’s notorious democratic deficit bounces back – painfully and disruptively. At the culmination of the crisis, with a new referendum as a dramatic climax, the European Union should make its mind up about two fundamental questions: Which political future does it offer to the Europeans – and particularly to those in the southern Member States – apart from the principle of austerity? And how will it go about achieving more legitimacy around such key policies? The hope is that the European answer to these questions will be found before the next crisis induced referendum strikes. Who is really leading the European Union?